The first copy out of Nagesh Mishra presents I.A. Films in association with Qureshi Movies JAI JAI MAA SHERAWALI, edited and directed by Israr Ahmad. The films music right has been taken by T-Series and audio will launched in Next week. The film to be released shortly. Cast : Sudha Chandran in title role as Sherawali Maa, Kadar Khan, Shamim Khan, Farha Naaz, Vishwajeet, Rana Jang Bahadur, Irfan Khan, Laeek Khan, Raza murad, Swati Agarwal, Arun Singh, Brij Gopal, Nishat Jahan, Nagesh Mishra and in special appeariances Lakhbir Singh ‘Lakhkha’. Producer: I.A. Films & Waseem S. Khan. Writer: O.P. Pandey. Choreographer: Shakur & Anis Khan. Lyrics: Sachchidanand Pandey & O.P. Pandey. Art: Suresh Pillai. Action: Nisar Khan. DOP: Mansoor Shaikh. Music: Salim Sen. Singers: Lakhbir Singh ‘Lakhkha’, Udit Narayan, Shahid Maliya, Mohd. Salamat, Pauni Pandey, Rekha Rao, Khushboo Jain. 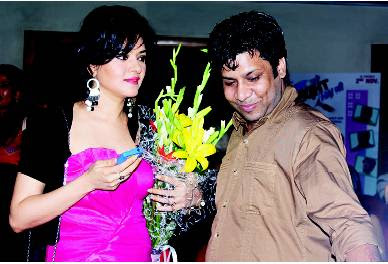 The music launch of the film FUTURE TO BRIGHT HAI JI had many surprises. Legendary lyricist Naqsh Lyallpuri graced the occasion and unveiled the music CD. The writer director of the film, Sanjay Amar worked with three different music directors to capture the different moods in the film. The leading lady of the film Sonal Sehgal has also turned lyricist for the film, it was revealed. Producer Rama Mehrotra, film’s creative producer Hari Mehrotra, Naresh Kamath and Rahat Kazmi were amongst those present here. The film, by Reel Life Production Pvt Ltd, releases on November 2, 2012. The below – mentioned release dates have been given by the producers and distributors of the movies. At times, the movies get postponed for various reasons, hence the list is published with latest updates. All releases are subject to CENSOR CERTIFICATION. *ring : Sridevi, Amitabh Bachchan and Priya Anand. Director : Ram Gopal Verma. *ring :, Emran Hashmi, Sagarika Ghatge, Neha Dhupia, Aditya Pancholi.